TERROR AT THE TABLE! 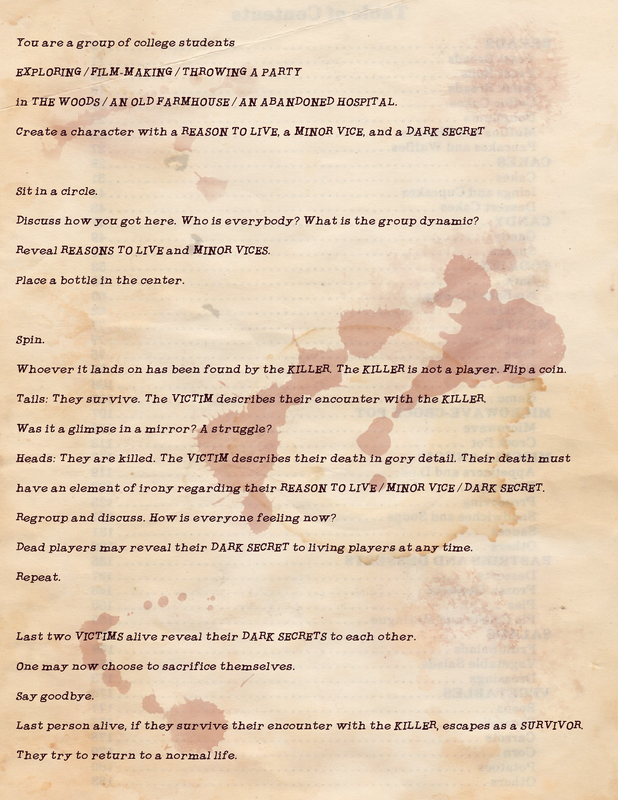 is an RPG where you and your friends live through a slasher film. It can be played as a goofy B-movie with over the top deaths or with deeper character interactions and heartbreaking reveals. TATT! 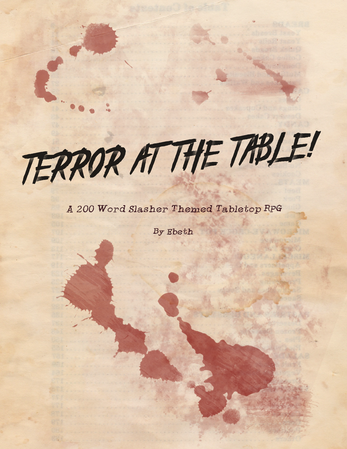 was a finalist in the 2018 200 Word RPG Challenge. You can view the original submission here. Thank you to Liz & r25th for their help in proofreading and offering feedback. in THE WOODS / AN OLD FARMHOUSE / AN ABANDONED HOSPITAL. Discuss how you got here. Who is everybody? What is the group dynamic? Reveal REASONS TO LIVE and MINOR VICES. Place a bottle in the center. Whoever it lands on has been found by the KILLER. The KILLER is not a player. Flip a coin. Tails: They survive. The VICTIM describes their encounter with the KILLER. Was it a glimpse in a mirror? A struggle? Heads: They are killed. The VICTIM describes their death in gory detail. Their death must have an element of irony regarding their REASON TO LIVE / MINOR VICE / DARK SECRET. Regroup and discuss. How is everyone feeling now? 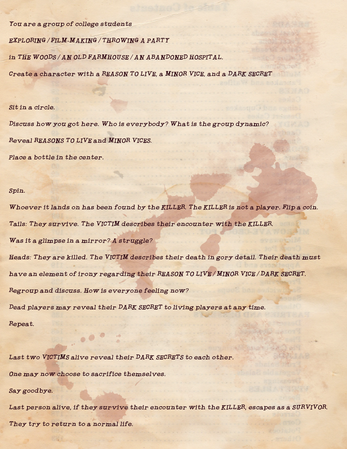 Dead players may reveal their DARK SECRET to living players at any time. Last two VICTIMS alive reveal their DARK SECRETS to each other. One may now choose to sacrifice themselves. Last person alive, if they survive their encounter with the KILLER, escapes as a SURVIVOR. They try to return to a normal life.